By employing twelve access points from the adjacent buildings and eight level shifts on the ground floor as a mechanism for carving and shaping the final form and program areas, we created an experience of culinary arts instruction akin to a public theatrical production. 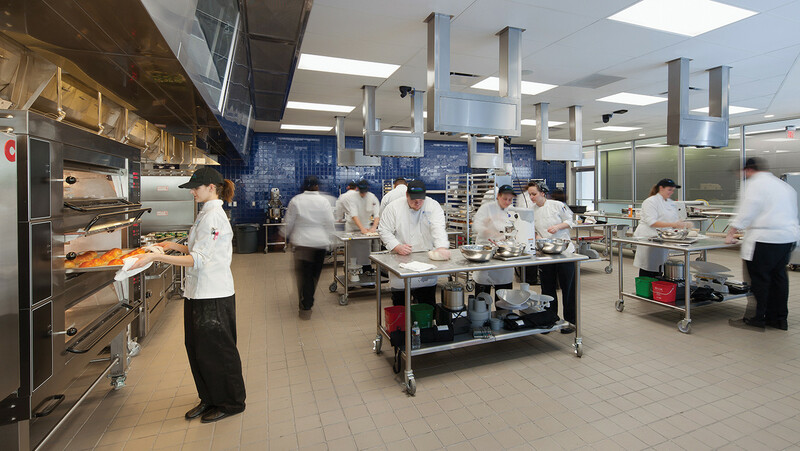 Sited between existing campus buildings with complex access and service issues, the Ben & Jane Norton Culinary Arts Center combines two unrelated programs: the college’s relocated TV studio and the new culinary school. 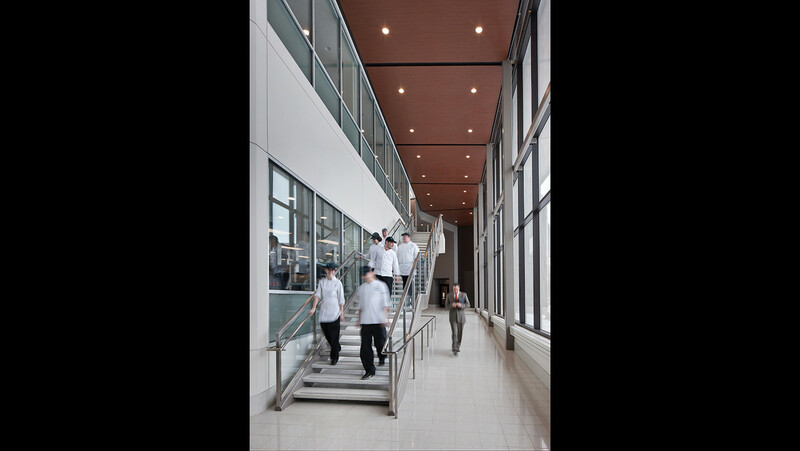 By employing twelve access points from the adjacent buildings and eight level shifts on the ground floor as a mechanism for carving and shaping the final form and program areas, we created an experience of culinary arts instruction akin to a public theatrical production. 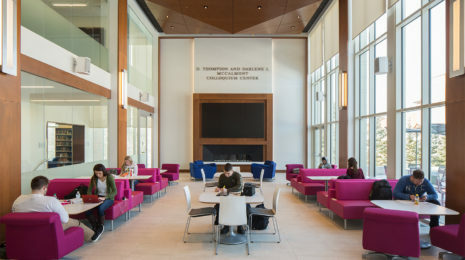 The west façade, acting as the formal building entry, is a proscenium-like frame of metal and wood around a wall of glass that allows views into and out of the kitchens on the lower and upper levels. The entry plaza is an outdoor living room with shaded multi-level seating encouraging viewers to watch the interior activity. 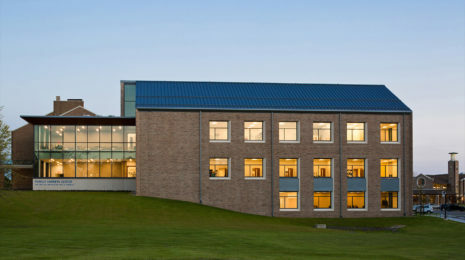 A rotated vestibule with a monumental stair cuts across the front of the building acts as the main pathway between the three buildings and allows viewers a close look into the teaching kitchens. Like the exterior, the demonstration kitchen and lecture room exhibit a series of overhead wood frames with that spill out light, reminiscent of a stage. 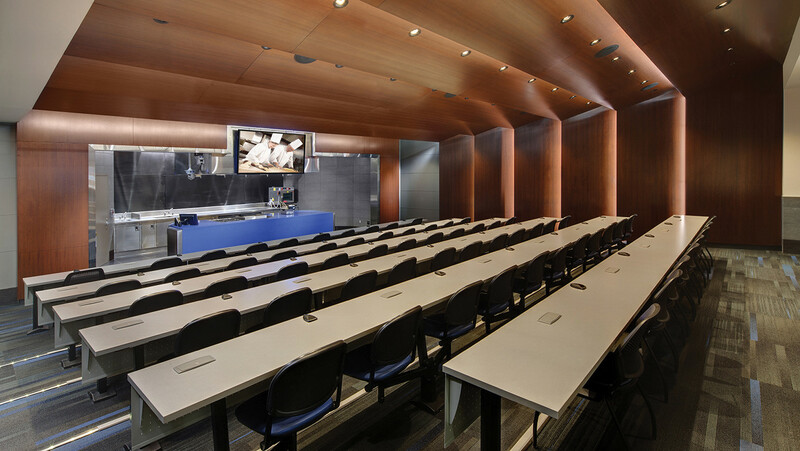 The kitchen and lecture room relationship is orchestrated as a culinary theater between demonstrator and student. The space is an interactive distance-learning center that encourages audience participation. The three additional teaching kitchens feature state of the art video cameras and viewing screens including a two-way floating glass screen that can be simultaneously viewed inside and outside the kitchens. The TV studio takes on a similar process where the studio itself is on display to the passerby, but so is the control room and the video technology room where all the participants in the process are “on the air” to the public. 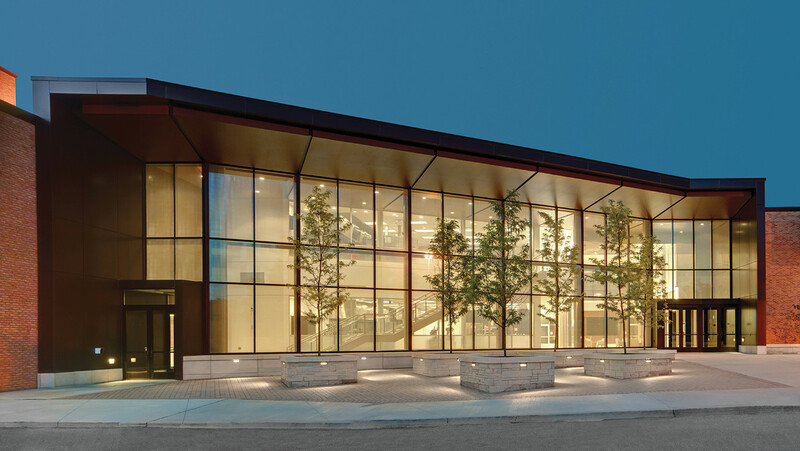 The exterior materials are related to the adjacent buildings with blended brick, light buff concrete, and dark bronze metal. 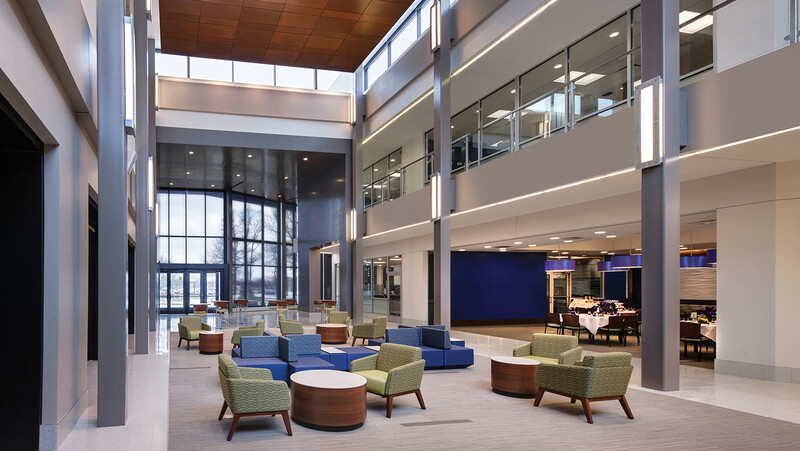 The interior pulls the exterior materials inward, transitioning to a crisp, clean palette centered on stainless steel, medium grey metal, blue tile, and a warm wood. The project is pursuing LEED Certification with high-efficiency kitchen equipment, low-volume cooking hoods, reduced-flow plumbing fixtures, and LED lighting throughout.